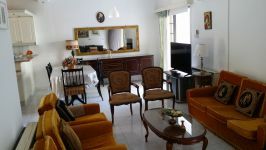 A beautiful and modern fully renovated to a high standard one bedroom maisonette in private gated well maintained complex with swimming pool, garden, barbeque area and playground for children. Situated 300 meters from main beach front and in the heart of main tourist area - Potamos Germasogeias. The property is spacious (74 sq.m covered area) with small private front garden, and huge back common garden and pool area, with verandas on both floors, and is fully loaded with all new facilities, appliances, and furniture that would be expected for a perfect choice! The complex is about 7-8 y.o. in immaculate condition. This 1-bedroom maisonette house in Potamos Germasogias, Limassol is being offered for rent (long term) at EUR 1.350.